A taste of the good life! The first local Acai/smoothie bowl take-away cafe in the heart of Biarritz, catering to those who’re craving a sweet & refreshing treat. Inspired by island life adventures from all over the globe and the culture that revolves around surfing and a fresh & healthy diet. From Hawaii to LA, from Bali to Biarritz. Bali Bowls is delicious and unforgettable!! We aim to surprise you every time with our Acai, our locally sourced fresh fruit & veggie bowls, smoothies & (cold press) juices and coffee. Sometimes we just want a quick, light, and body-beneficial meal on the go. A healthy snack or just a great way to start your day! Our ingredients are sourced locally and seasonally. Our product is always non-diary with no added sugars. A bowl with a texture that looks like ice-cream: we call it “nicecream”. Bali Bowls represents a tropical lifestyle of freedom, travel, health, activities, joy and counting your blessings every day. Our product is our pride! Take a break from your cooking and grab a healthy breakfast, lunch or snack. Your daily dose of vitamins! 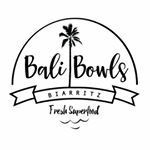 Bali Bowls gives you that tropical feeling of freedom, a brand that makes you travel the world. If you have had a Bali Bowl before, you know all our bowls are made fresh to order. Everything we offer happens on the spot! Each Bali Bowl is created by hand in a multi step process that can take a little time. The line can get long but…. it’s totally worth the wait, we promise!